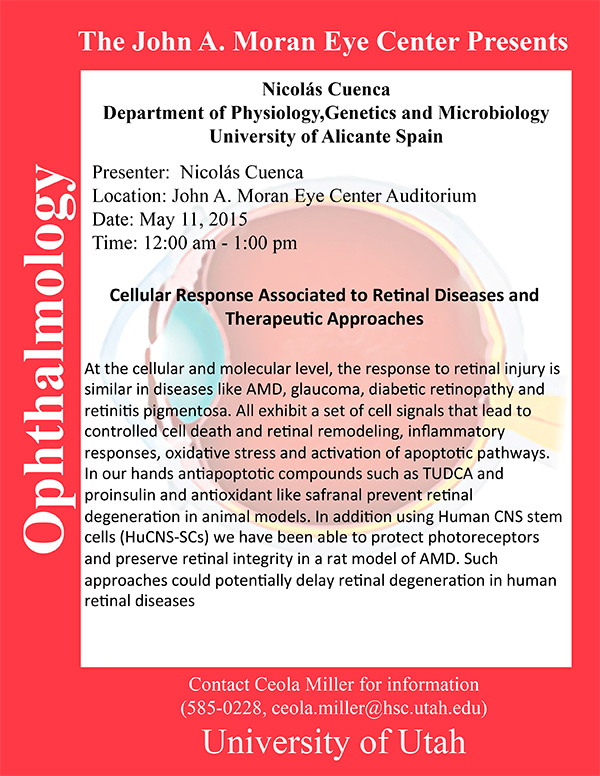 Nicolás Cuenca, professor Department of Physiology,Genetics and Microbiology University of Alicante Spain will be delivering a seminar, Cellular Response Associated to Retinal Diseases and Therapeutic Approaches on Monday, May 11thth at Noon in the the Moran Eye Center auditorium. Abstract: At the cellular and molecular level, the response to retinal injury is similar in diseases like AMD, glaucoma, diabetic retinopathy and retinitis pigmentosa. All exhibit a set of cell signals that lead to controlled cell death and retinal remodeling, inflammatory responses, oxidative stress and activation of apoptotic pathways. In our hands anti-apoptotic compounds such as TUDCA and proinsulin and an3oxidant like safranal prevent retinal degeneration in animal models. In addition using Human CNS stem cells (HuCNS-SCs) we have been able to protect photoreceptors and preserve retinal integrity in a rat model of AMD. Such approaches could potentially delay retinal degeneration in human retinal diseases.